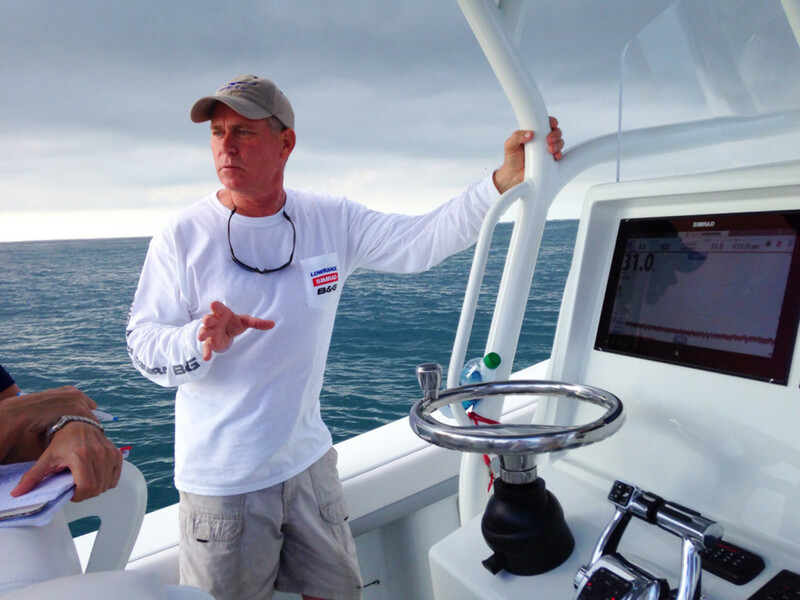 Simrad representative Mark Maus explains some of the high-tech features found on the twin 16-inch Simrad multitouch displays on his center console. DUCK KEY, Fla. — Navico aims to become an $800 million company as it continues to grow and improve a slew of marine electronics across three brands for both recreational and professional uses, executives of the company said Wednesday at a product presentation event for the media in the Florida Keys. "It is not only this year that we&apos;ve made strong goals," Navico president and CEO Leif Ottosson told me during a sit-down interview at Hawks Cay Resort on Duck Key. "After 2009, when we saw the market basically cut in half, we needed to radically change the path of the company to be successful with this merger of the three companies of Simrad, Lowrance and B&G that make up Navico. We have had three-year plans that we&apos;ve been executing." And those plans seem to be working. The company has gained 6 to 7 percent in global market share and revenues are up 60 to 70 percent, Ottosson said. Currently Navico is a $275 million company and it would like to hit the $800 million mark in three years, executive vice president and COO Louis Chemi said during the interview session. The company will do that by building on its recreational and light-professional business and "gaining a deeper presence in the professional market and expanding our freshly minted content division," Chemi said. That division concentrates on capturing data from the systems and disseminating it through technologies and devices such as tablets and smartphones. Chemi gave me a summary of the top products being highlighted at the three-day press event. (Twenty-four journalists attended, testing product on 11 boats). The Simrad NSO evo2 displays and processors are multi-touch, sunlight-viewable displays as large as 24 inches. "These are the pinnacle of this market," Chemi said. Within the B&G brand, Navico is showing its H5000 instrument and autopilot system, which includes displays, wind sensors and other technology offered at a wide range of price points. In the Lowrance brand, Chemi talked about the SpotlightScan feature, "which allows you to move a transducer that is mounted on a trolling motor and actually look in different segments of the water," he said. Looking ahead, Ottosson said the focus will be on technology integration. "We are going to see in boating more of what we see in cars today," Ottosson said. "We will see integration of technology and aids to help you maneuver the boat and steer the boat. The theme going forward is how do we make boating easier, safer and more fun?"